Much has been discussed about the future of Morris and how we get young people on board, but nothing has been said about the associated customs and traditions which can entice young people in through a different route. For many years now Ashley's Rise Junior Morris has performed a version of the Weston-sub-Edge play at Colston Hall, Bristol, which has changed until it is probably the Ashley's Rise Mumming play. We do it because it is traditional, because it is fun and because it is a celebration of the end of the old year and the birth of the new year. For the first time, in 2008, I was brave enough to offer a Mumming project to a school in South Gloucestershire as part of the Christmas on the Hill community event. I asked for a group of 12 and expected a hall to work in. What I got was a group of 30, a classroom full of desks and chairs and the thought 'whatever I am going to do!'. Luckily I had costed in an assistant who had been through Ashley's Rise and was now old enough to help teach. We scoured our friends around the country and came up with several sets of longswords. Alys had a baptism of fire teaching 5 sets of yr 4 pupils (8/9 yr olds) who had never done or seen any Longsword before. I had the easy job - the self selected group of Players who would perform the Mumming Play. As always I asked all the players to learn the whole play (by now, further adapted to fit the school), whichever part they had (and including the girl who had nothing to say but would be running around with the hand held mike), in case of illness or injury on the day. We had 6 sessions allocated but ended up with only 5 as there was a school trip on one of our allocated days. 5 hours to get something together which was worthy of public performance. The young people were great. They threw themselves into it without realising the challenge which lay ahead of them. The class teacher also helped out between practices and so put in a bit of his own style (even though he had never seen Mumming before either!). Not all 30 class members took part in the public performance. In fact only the players were able to perform on the day, which made things a bit easier. Along with a neighbouring school who we had been doing a Morris project with, the first performance was in a freezing square surrounded by shops and a huge audience of families, friends and passers by, none of whom knew what they were looking at but it was 'their' children doing it and they were happy to tell people around them to be quiet in no uncertain terms! There was then a parade of all the local groups - bands, bikers, local dance school - and our Morris dancers and Mummers, leading to a nice warm hall where our final performance was on the stage (which was where we needed the girl running around with the hand held mike). The play went very well at both venues. Considering the players had never managed to create a sturdy star in Longsword practice they managed to create something which held together on both performances. The Mumming project was deemed a great success by all those involved as well as local dignitaries and there was a call for the project to happen every year. Sadly, as with all these projects, this is subject to someone finding the funding to make it happen. But just knowing that it was such a success means that I know that somewhere, somehow, there will be another Mumming project for young people. I thank all those who made it possible. and workshop provider to young people. It's great to see the children do a mumming play. 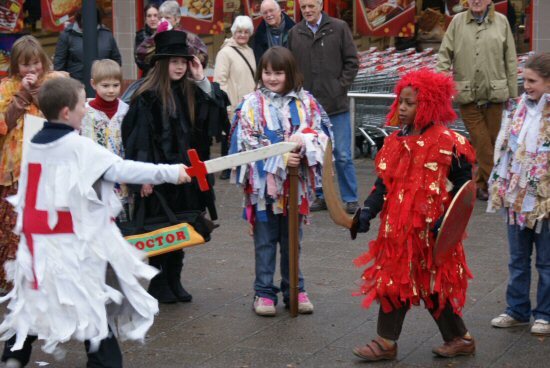 Some eight or nine years ago I was asked to help arrange a mumming play for my daughters primary school. In the end we had to do a mass mumm with several children doing each part there was so much interest. Some still mention it at 19 years old. Luckily both my daughter now 19 and my son 16 play parts in our traditional Christmas Eve play in Lacock 2 new recruits is a start.